I am already at an age and additionally in a state where I must always wash my feet thoroughly before bed, in the event of having to be removed by an ambulance in the Night. Had I examined the Ephemerides that evening to see what was happening in the sky, I wouldn’t have gone to bed at all. Meanwhile I had fallen very fast asleep; I had helped myself with an infusion of hops, and I also took two valerian pills. So when I was woken in the middle of the Night by hammering on the door – violent, immoderate and thus ill-omened – I was unable to come round. I sprang up and stood by the bed, unsteadily, because my sleepy, shaky body couldn’t make the leap from the innocence of sleep into wakefulness. I felt weak and began to reel, as if about to lose consciousness. Unfortunately this has been happening to me lately, and has to do with my Ailments. I had to sit down and tell myself several times: I’m at home, it’s Night, someone’s banging on the door; only then did I manage to control my nerves. As I searched for my slippers in the dark, I could hear that whoever had been banging was now walking around the house, muttering. Downstairs, in the cubbyhole for the electrical meters, I keep the pepper spray Dizzy gave me because of the poachers, and that was what now came to mind. In the darkness I managed to seek out the familiar, cold aerosol shape, and thus armed, I switched on the outside light, then looked at the porch through a small side window. There was a crunch of snow, and into my field of vision came my neighbour, whom I call Oddball. He was wrapping himself in the tails of the old sheepskin coat I’d sometimes seen him wearing as he worked outside the house. Below the coat I could see his striped pyjamas and heavy hiking boots. With undisguised astonishment he cast a glance at my linen suit (I sleep in something the Professor and his wife wanted to throw away last summer, which reminds me of a fashion from the past and the days of my youth – thus I combine the Practical and the Sentimental) and without a by-your-leave he came inside. For a while I was speechless with shock; without a word I put on my tall snow boots and the first fleece to hand from the coat rack. Outside, in the pool of light falling from the porch lamp, the snow was changing into a slow, sleepy shower. Oddball stood next to me in silence, tall, thin and bony like a figure sketched in a few pencil strokes. Every time he moved, snow fell from him like icing sugar from pastry ribbons. ‘What do you mean, dead?’ I finally asked, my throat tightening, as I opened the door, but Oddball didn’t answer. He generally doesn’t say much. He must have Mercury in a reticent sign, I reckon it’s in Capricorn or on the cusp, in square or maybe in opposition to Saturn. It could also be Mercury in retrograde – that produces reserve. We left the house and were instantly engulfed by the familiar cold, wet air that reminds us every winter that the world was not created for Mankind, and for at least half the year it shows us how very hostile it is to us. The frost brutally assailed our cheeks, and clouds of white steam came streaming from our mouths. The porch light went out automatically and we walked across the crunching snow in total darkness, except for Oddball’s headlamp, which pierced the pitch dark in one shifting spot, just in front of him, as I tripped along in the Murk behind him. ‘Don’t you have a torch?’ he asked. Of course I had one, but I wouldn’t be able to tell where it was until morning, in the daylight. It’s a feature of torches that they’re only visible in the daytime. Big Foot’s cottage stood slightly out of the way, higher up than the other houses. It was one of three inhabited all year round. Only he, Oddball and I lived here without fear of the winter; all the other inhabitants had sealed their houses shut in October, drained the water from the pipes and gone back to the city. Now we turned off the partly cleared road that runs across our hamlet and splits into paths leading to each of the houses. A path trodden in deep snow led to Big Foot’s house, so narrow that you had to set one foot behind the other while trying to keep your balance. ‘It won’t be a pretty sight,’ warned Oddball, turning to face me, and briefly blinding me with his headlamp. No, I didn’t. I was asleep, numbed by hops and valerian. We passed a tumbledown barn and moments later Oddball’s torch fetched out of the darkness two pairs of shining eyes, pale green and fluorescent. The Deer were standing in the snow almost up to their bellies. They gazed at us calmly, as if we had caught them in the middle of performing a ritual whose meaning we couldn’t fathom. It was dark, so I couldn’t tell if they were the same Young Ladies who had come here from the Czech Republic in the autumn, or some new ones. And in fact why only two? That time there had been at least four of them. ‘Go home,’ I said to the Deer, and started waving my arms. They twitched, but didn’t move. They calmly stared after us, all the way to the front door. A shiver ran through me. Meanwhile Oddball was stamping his feet to shake the snow off his boots outside the neglected cottage. The small windows were sealed with plastic and cardboard, and the wooden door was covered with black tar paper. 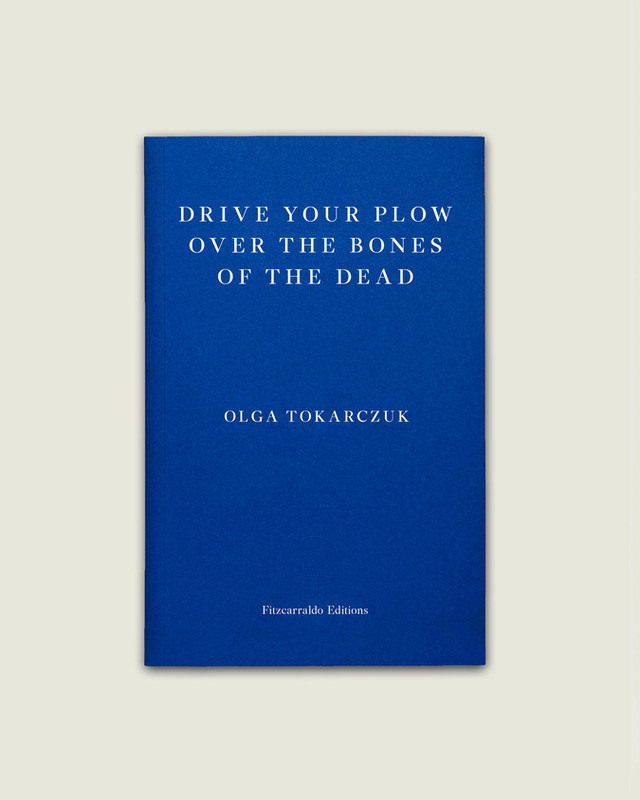 Olga Tokarczuk is one of Poland’s best and most beloved authors. Her novel Flights won the 2018 Man Booker International Prize, in Jennifer Croft’s translation. In 2015 she received the Brueckepreis and the prestigious annual literary award from Poland’s Ministry of Culture and National Heritage, as well as Poland’s highest literary honour, the Nike and the Nike Readers’ Prize. Tokarczuk also received a Nike in 2009 for Flights. She is the author of nine novels, three short story collections and has been translated into thirty languages.